This train station, as you see it, was inaugurated in 1865. It was built by the Montreal & Vermont Junction Line and was part of a complex railroad network that linked Montreal to Boston and New York. The section passing through Saint-Armand was completed in 1860 and was called the Saint-Armand Sub. Lovell’s Gazetteer of British North America mentions the intense commercial activity of our village at the time. According to this guide published in 1873 the value of commercial goods transiting by boat or rail through St. Armand in the single year 1872 was worth 17,724 dollars. The Bank of Canada evaluates it to one half million of our present-day dollars. 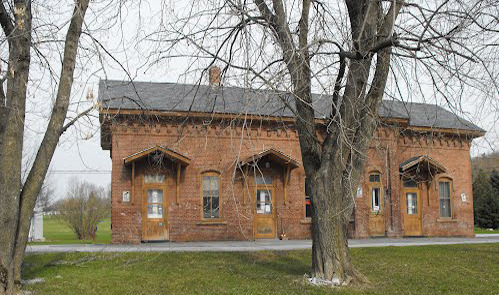 Apart of the train station, at the time in Saint-Armand, you could find a telegraph office, an English language high-school and a carriage factory. The station was in use until 1956, the year when the railway line went bankrupt and was abandoned. Since 2014 it houses Saint-Armand’s municipal services.